* A couple of weeks ago I suggested that, as we headed into a group of “closed” primaries, we would add a discussion about open vs closed primaries to the ones already underway about superdelegates and caucuses. We’re especially likely to hear about that from Sanders supporters because it is their candidate who will be impacted the most. Emily Atkin is the first I’ve seen to weigh in with an article titled: New York’s Upcoming Primary Is ‘Closed Shut’ To Certain Voters. More than 3 million people — about 27 percent of the state’s voters — were registered outside the Republican and Democratic parties as of April. In a presidential campaign marked by popular non-establishment candidates and high independent voter turnout, those voters could swing the primary results significantly. * I’m not sure this qualifies as a “fun” fact, but it sure is one worth pointing out. FUN FACT: Americans United for Life have named Louisiana the most pro-life state for 6 years. It has the 3rd highest infant mortality rate. * Senator Elizabeth Warren has been busy lately. As Martin pointed out earlier today, she wrote a blistering editorial in the Boston Globe about Senate Republicans obstructing President Obama’s Supreme Court nominee. But in a fascinating pairing, she co-authored an article in Huffington Post with Sen. Cory Booker lauding the Obama administration’s new rule that raises the standards for investment advisors. The article itself didn’t break much new ground. 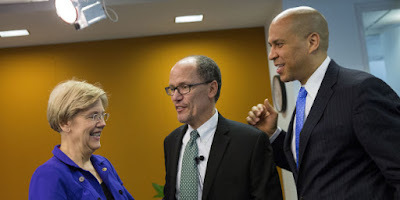 But this photo of the two senators with Labor Secretary Tom Perez packs quite the political punch. 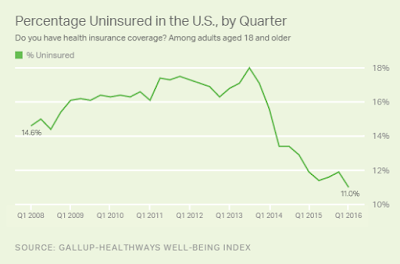 * I’m assuming that this is exactly the kind of thing Vice President Joe Biden was talking about when he said that Obamacare was a BFD. * Finally, the folks of Greensboro, NC are the latest to feel the effects of Republicans in their state passing a law about “bathroom and shower management.” Here is a statement released today by Bruce Springsteen.